Traveling is a brutality. It forces you to trust strangers and to lose sight of all that familiar comfort of home and friends. You are constantly off balance. Nothing is yours except the essential things: air [rarefied! ], sleep, dreams, sea [mountains here! ], the sky - all things tending towards the eternal or what we imagine of it.” -- Cesare Pavese. As I trudged along the "off-season" months of end September and first half of October 2012 along the absolute desolate high mountain tracks and later on the Stok Kangri mountain trek, I recall this line, having read somewhere among the travel quotes. But, isn't a travel supposed to be smooth and relaxing for the mind and the soul? Can over 20 days experiencing rough situations and physical conditions still leave one with a sense of smile and accomplishment? And as one grows older, particularly at 40 years of age, is it too late to face the trials of a strenuous yet one heck of an adventurous travel? And still after all this talk, can a travel be brutal yet have a fairy tale ending? 2. 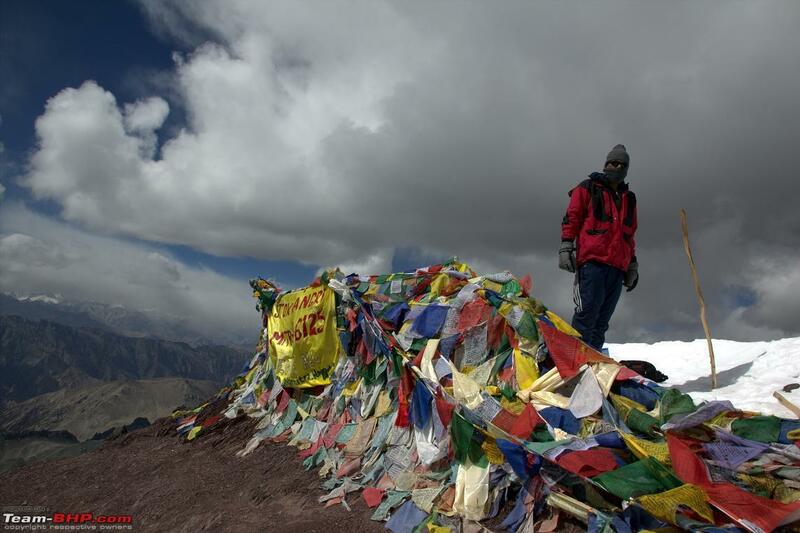 Followed immediately with a brutal yet fast high altitude mountain trek [ [done in 4 days, Leh-Stok-Leh] ] to Stok Kangri Summit at 20,182 feet, on October 9, 2012. Night temperatures were around -10 C and worse with the wind the chill factor. Brutal bicycling was immediately followed by a brutal mountaineering trek with a local guide to Stok Kangri - at 6153 m/20, 182 feet. - on October 9, 2012. Not bad for a 40-year-old! 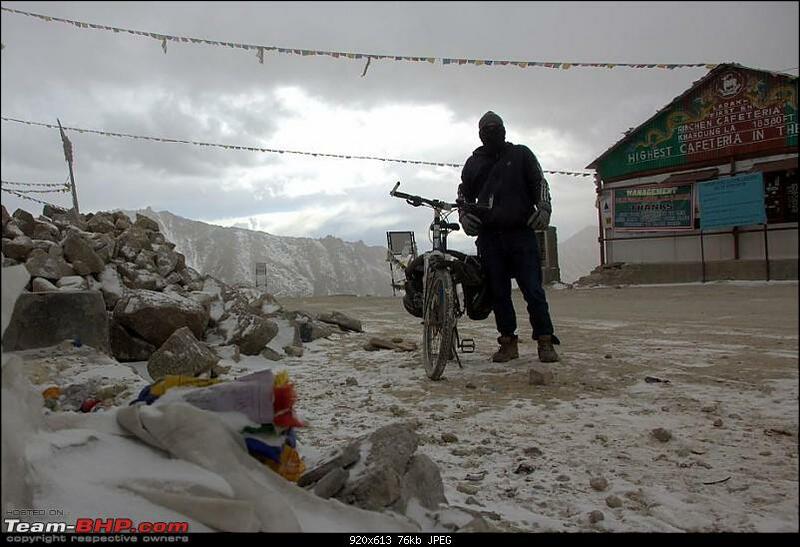 Bicycle to Leh - to Stok Kangri summit trek - and then again a day trip bicycle ride to Khardung la top, which was absolutely deserted as I reached late afternwith snow starting to fall. 4. Finally a canonball run on the Tempo Traveller as it made its way through the snowed and absolute desolate highway from Leh to Manali with the bicycle on top. [ 500 km/16 hours nonstop] - an unique experience in itself. As I start on this memorable travel story, I end this post again with a travel quote from Cesare Pavese - We do not remember days, we remember moments. -- but when the moments stretch to days, it all culminates to one of the best travel done in a lifetime! Before I go into the day-to-day part of the travel and trek story, the subsequent 3 posts will be about the schedule, the equipment list and lastly how the idea came about, some 4 months before the trip, the funda that I gathered from scratch, as I started bicycling again after a gap of 23/24 years, the training that got me going - thus that post more of an summary of how the months before the trip went by. 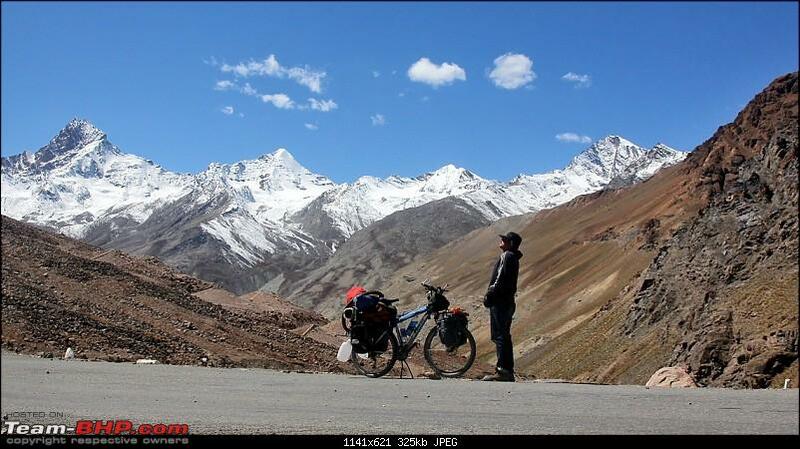 Bicycling this 500+ km highway from Manali to Leh with that diversion to Tso Kar, does provide an unique perspective. Going at a rate of an average 5-6 km/hour - the spin off being the journey documentation will be a kind of a travel guide too - as this was not a zip drive but rather a slow-motion ride along this iconic road. Last edited by adc : 12th April 2013 at 01:06. Let me first post the schedule that was followed for the bicycle + trek travel. More details on the later posts of the day-to-day experiences. Of the days spent in bicycling, a couple of days can be reduced easily and more so if the diversion to Tso Kar from Debring is not taken. 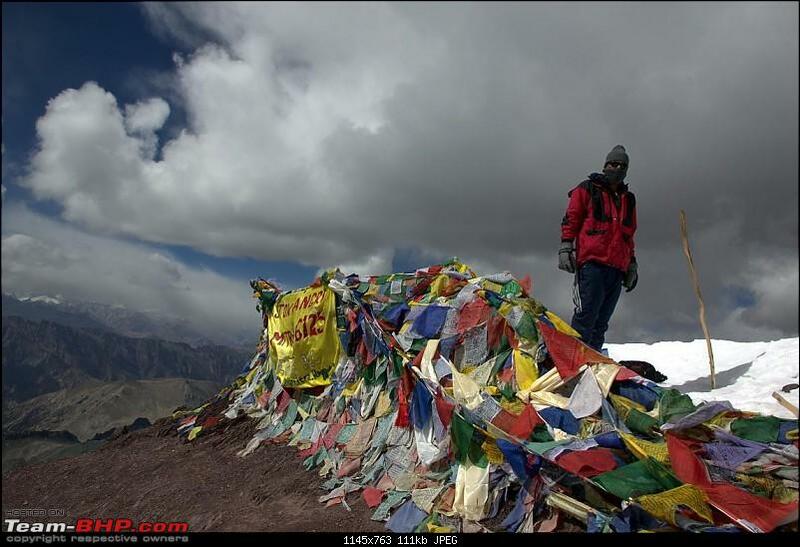 For the Stok Kangri mountain trek part, the days are less and should not be attempted in 4 days if not well acclimatized or if having altitude problems. It is more of a 6-8 day trek if done separately. End September-October has always been our favorite months for travel to Leh or Zanskar as seen by our past Safari travels [ Self-Drive Expedition Travel-Ladakh and cold desert Changthang in "off-season" Oct 10 and Self-Drive Exploratory Expedition->Zanskar+Unknown Kashmir-> "off-season October 2011 ], but then this was with a bicycle. 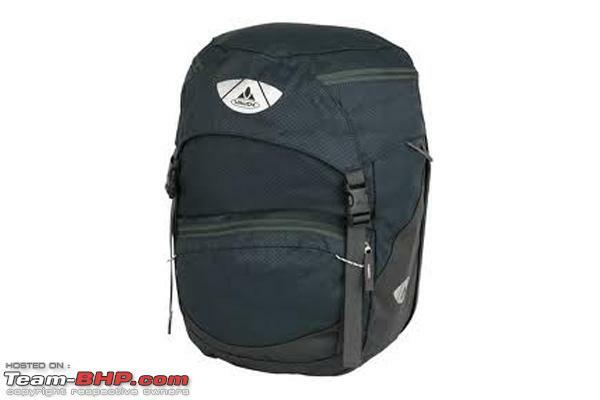 At first the start date was planned by 1st week of September, but then due to work situation and also since the panniers have not arrived through the postal service from USA, it got pushed back to the travel start date from Kolkata of 16th September. Further with a train journey time of 2 days and an additional delay at Manali for another 2 days, it was only by September 21, 2012 that I was started the ride, pushing the Stok Kangri date well into the 2nd week of October. The day I came down from the summit, it snowed heavily and the summit mountain trek closed down for the year. As said, latest by September 15th should be the start date from Manali if done by a bicycle. 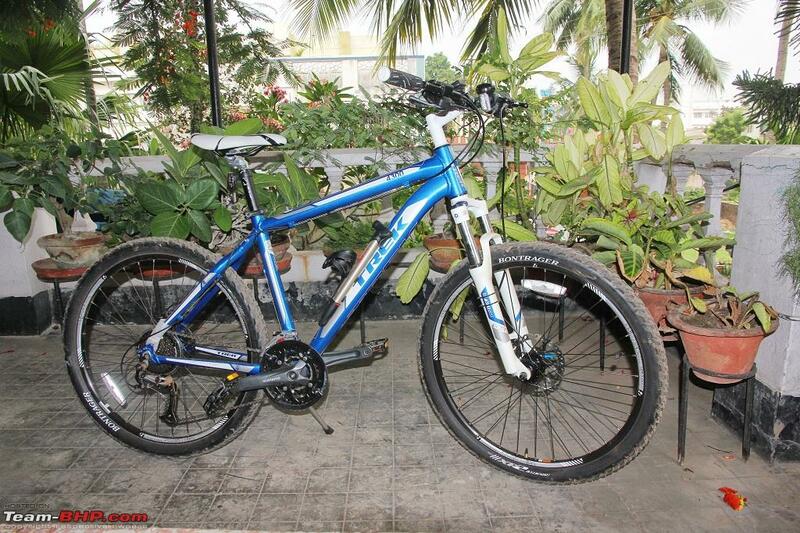 Day A - September 16, 2012, leave house at 2 pm with the Trek 4300D bicycle on Tata Ace. Train no. 12311 Howrah Kalka Mail, departing from Howrah at 7:40 pm. Majority of the evening spent in booking the bicycle in cargo van of Kalka Mail. Day B - on Train. Day C - Chandigarh at 4 am, take a taxi to Manali with cycle on top. Day D+E - Some part of office work still lingered which took the major portion of day "D" and also was looking out for kerosene for the stove that I carried. Kerosene is a rare commodity in Manali. In fuel stoves out there they use diesel mixed with 10% petrol. While it burns okay, it leaves quite a bit of soot and nozzle has to be cleared frequently. Got hold of some kerosene from a cobbler who said he managed to get somehow from a shop "high up in the hills". Day 2 Kothi to Marhi: 30 km. - Mentally and physically getting into the groove. Better than the first day. Day 3 Marhi to Sissu: 45 km. Surprisingly easy and unlike the 2010 trip give the Tandi fuel pump a miss! Keylong is the last place where you get chicken, tandoori roti or such food - so gorged over here. A short climb and then downhill to Jispa and then again a short climb to Darcha ] - last of the BSNL mobile phone calls to house. Serious climbing starts again and vegetation sparse now and a dramatic change in landscape from Patseo. It is only by a bicycle when things move by slow motion at 5 km/hr do you know that there is a Lower Zing zing bar and an Upper Zing zingbar!! The last 7-8 km after Patseo is strenuous to bone. 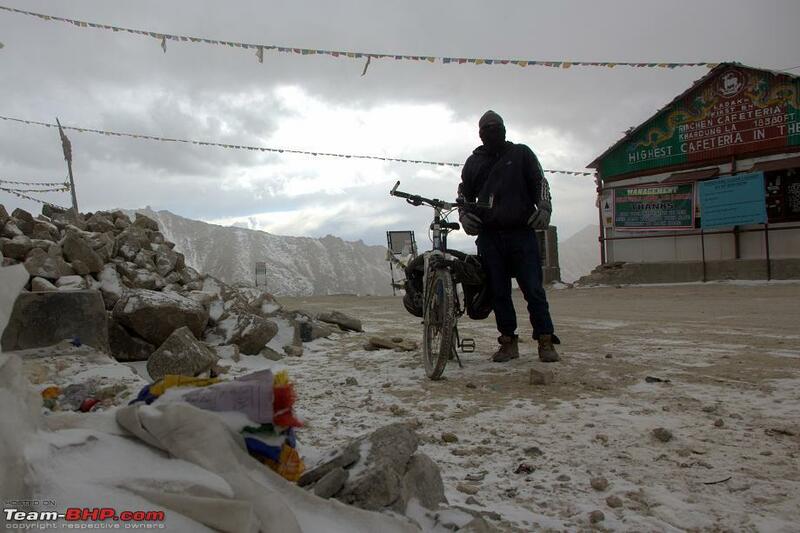 Another day to remember - crossing Baralacha la at 16,500 feet with O2 being 53% of what is found at sea level. Absolutely desolate on Sept 25, 2012, bicycling for hours before any vehicle crosses by. Again as a pass is crossed, it is a huge mental boost too - but then still there were nasty surprises to come. 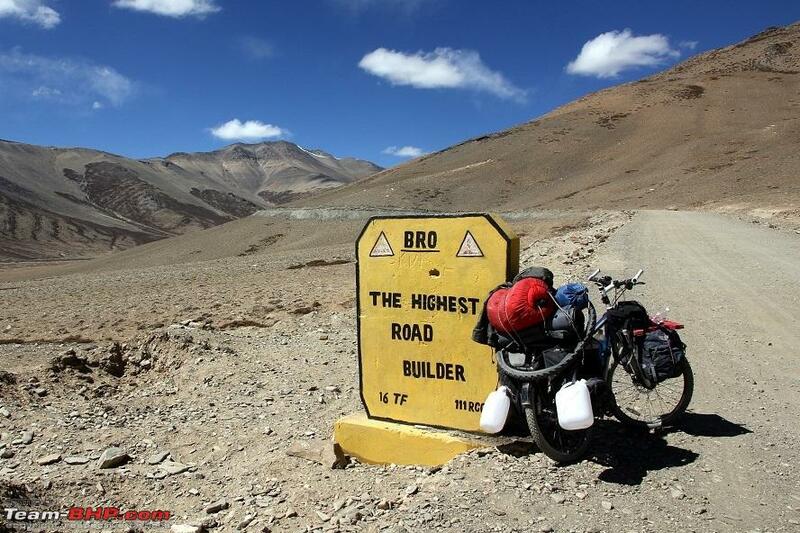 Crossing the top gives a downhill to enjoy, all the way down beyond Bharatpur and then to the plains of Sarchu. Day 8: Sarchu - Rest day. Other than doing some cycle rounds around Sarchu, particularly going towards the river gorge - memorable also where I meet a Portuguese cyclist with whom I shared the room at Sarchu, sharing the hookah with home grown tobacco being carried by a bunch of most affable Haryanvi guys going towards Leh and an impromptu bhangra dance at the desolate Sarchu plains with some Punjabi mundas blaring out from their Bolero!! 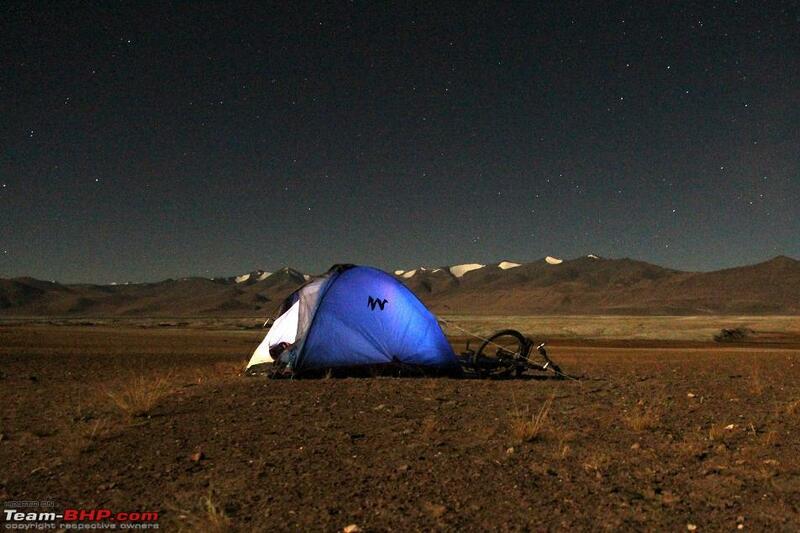 Day 9 Sarchu to Whisky Nullah: 55 km. A tough day not only for the never ending Gata loops [21 consequent switchbacks ] which you still might have somewhat prepared for mentally but what comes next or rather what comes rather late - the Nakeela Pass. 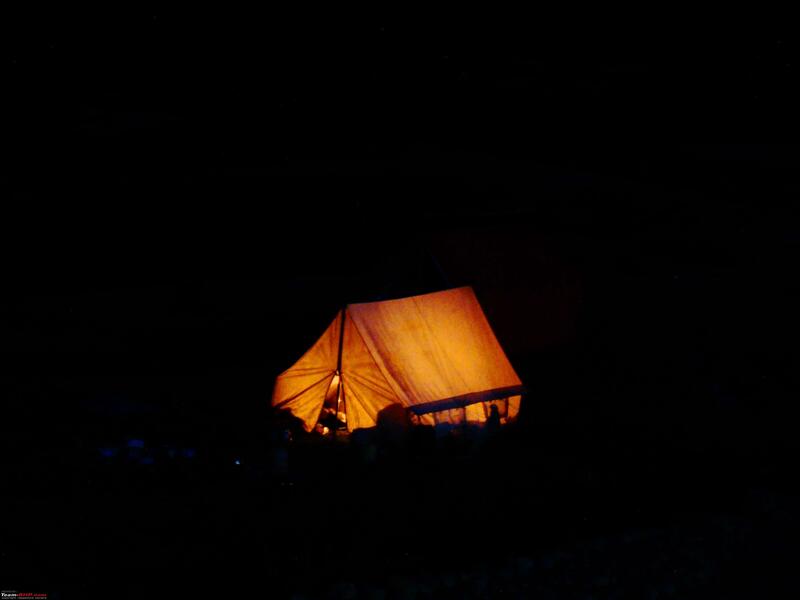 Whisky Nullah reached just in time as dusk falls, bitter cold desert conditions - a nomad's tent is the savior. More details as I elaborate on the day-to-day travelogue sections. The last day of September 2012, again an absolute desolate ride through gravel tracks to Lachung la [16,800 feet] and beyond through eerie gorges of Pang. Day 11 (Pang to Debring ): 42 km. A brief climb and then bicycling across the More plains - a mesmerizing experience. I stop at Debring, a single nomad tent is there in October 2012 and game of cards [Tin patti] in the evening with the father-son duo. Day 12 (Debring to Tso Kar): 22 km. 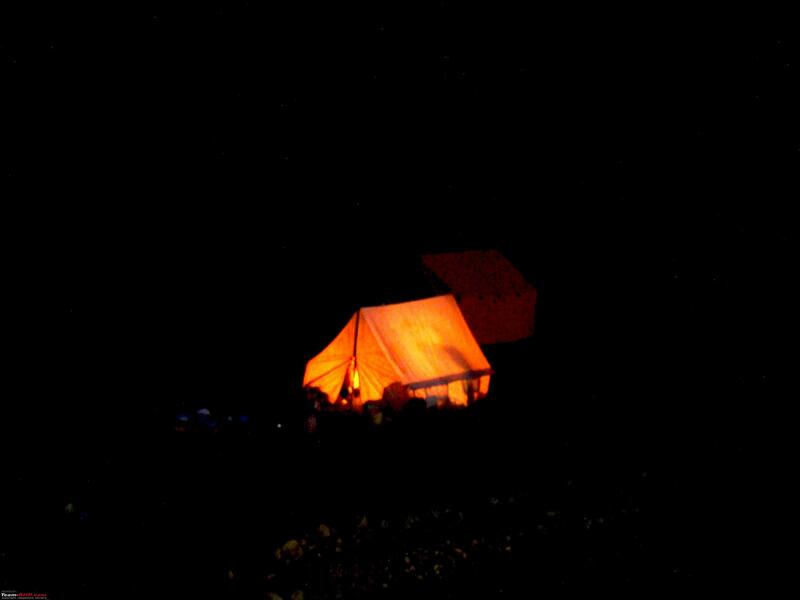 Branched off from Debring towards Tso Kar, magical solo night camping on the banks of the Lake. Day 13 Tso Kar to Rumste: 78 km. This was a tough, tough day. Huge distances, a climb up the mighty Tanglang la [17,580 feet] plus sand and gravel all the way. This was one day that pushed me to limits & Tanglang la if you do by bicycle will play with your mind! - Also remember the way I came downhill in pitch darkness to the first settlement after the pass towards Leh - A truck and then a sumo lighted up the downhill road as I came down at 50-60 kph, reaching Rumste at around 8:30 pm. More again as I write that day's experience. Day 14: Rumste to Leh: Around 75 km. - Finally at Leh. It is an overwhelming feeling. Day 15: At Leh, arranging permits and a guide for an "off season" mountain trek to Stok Kangri mountain summit trek. Many many thanks to Mr Qayoom of Altitudeadventure.in for making this part of the trek possible. Immediately he arranged for me a guide, Mr Sharif, an energetic youth of around 25 years age. Though I was alone and not in a group, the costs were still minimal, a direct result of arranging through a local travel agency. 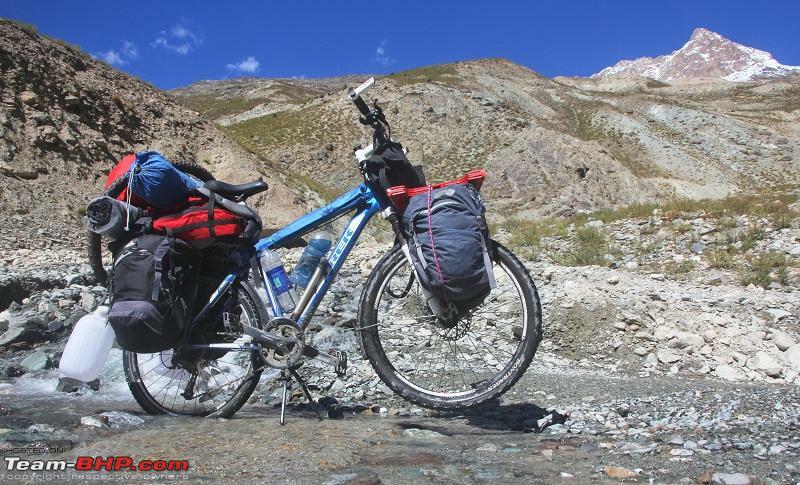 Though this trek should be done over some 6-7 days, since I was well acclimatized, having bicycled up the heights from Manali, I did it in 4 days, from October 6 to 9, 2012. Surprisingly after all the exertion, mentally and physically, of the all previous days of bicycling and trekkingit was not that tough! -speaking relatively though, particularly also as there is no 25+ kg of luggage on the cycle. Bitterly cold, absolute desolate, almost got stuck in a snowstorm at the Top. A huge and fantastic downhill back to the hotel. But then there is almost no time to rest today, tonight itself I pack up for the return journey to Manali - a nonstop journey of 16 hours on a Tempo Traveller. By October 11, 2012 the weather was starting to get bad and this journey gives a glimpse on how a group of drivers, on pure skill, faith and somewhat chance go through the 500 km of travel from Leh to Manali, more desolate and snowed out. 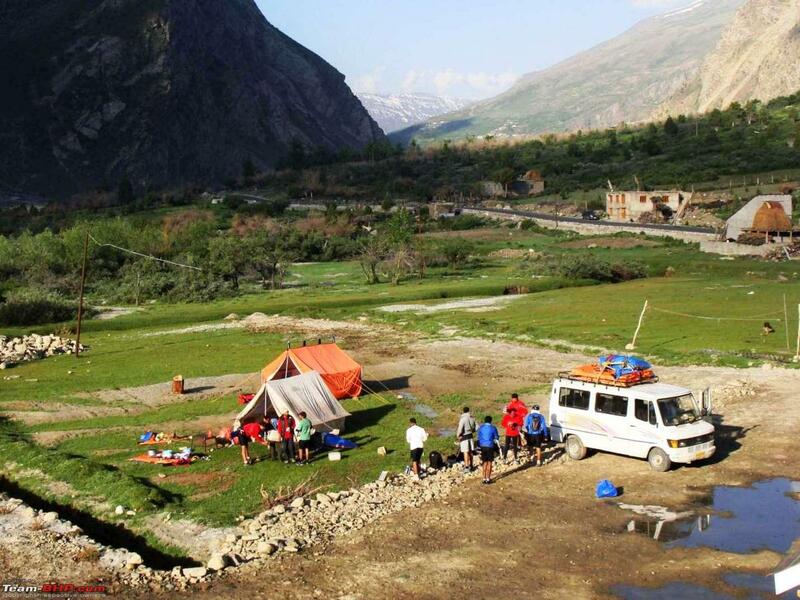 Day 21: Tempo Traveller journey ride 16+ hours nonstop, starting around 12 midnight from Leh and reaching Manali at 7 pm. Day 22 - At Manali and fix up a taxi for return. Day X - By Taxi back to Kalka with cycle on top, booked and loaded the bicycle on the cargo van. Day Z - Really good to be back home!! October 14, 2012 at 1:38 pm. And thus ends a journey and a trek that sometimes comes once in a lifetime, the varied experiences, the people met, the lands seen will cherish forever. As said, more details of each and every day later on the day-to-day travel posts. Last edited by adc : 12th April 2013 at 13:44. As the travel idea came about some 5 months prior, reading on the internet I went about procuring some of the vital items from USA. With more time and study, many of the things are quite available out here as I see now. Those procured overseas were send via USA where my cousin sister lives who in turn sent it to my address via US Postal. Thanks a lot Dolu didi!! Around 15% customs duty was applicable on 1 packet while on the other around 7% and another nothing. All packets by US postal and then Indian Postal service. The accomplished Portuguese cyclist [he was doign a trip from uttaranchal to manali to leh to srinagar and then all the way to mumbai!!!!] 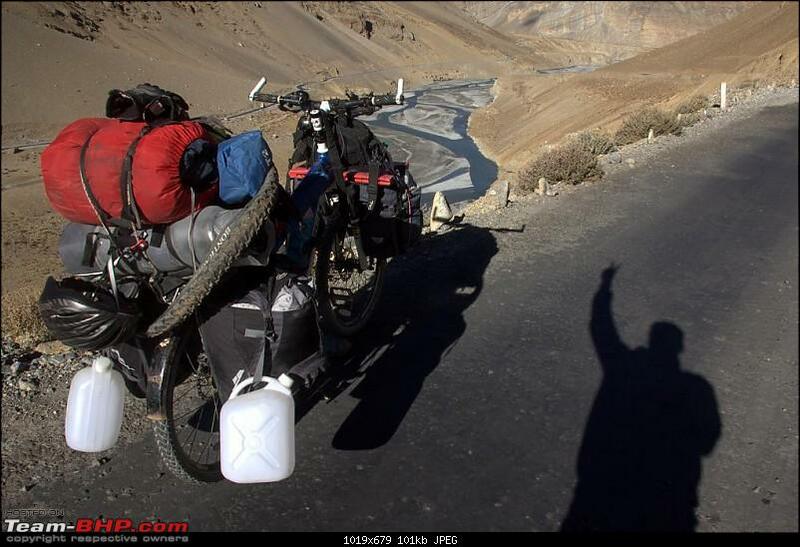 who I came across at Sarchu took a picture of my cycle - he had to take a pic of such an overloaded one. Quite a few things were extra weight and could have been reduced and also some items were extra as trekking was also a part of this travel. 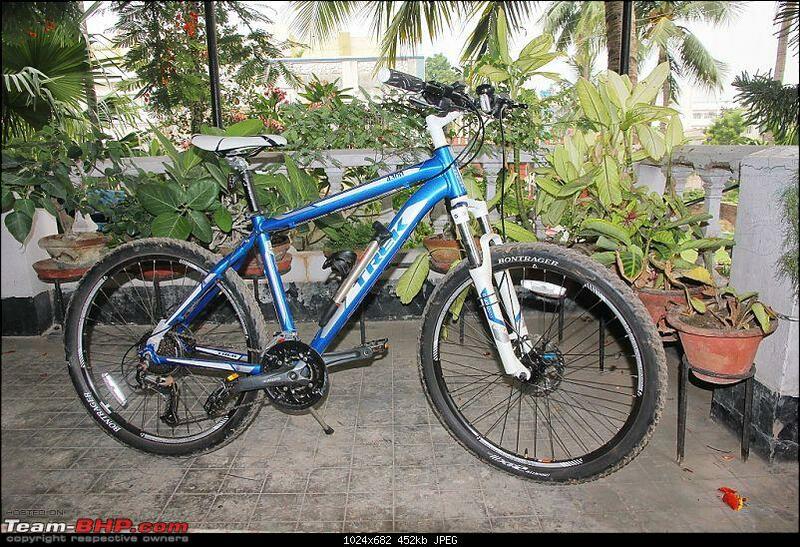 The Trek 4300 D 2012 Mountain Bike comes equipped with a 27-speed [3x9] Shimano drivetrain. 100mm suspension fork has a hydraulic lockout, Alpha Gold Aluminium frame, Bontrager Evoke saddle, Oversize Bontrager handlebar and stem. Hayes Dyno Sport hydraulic disc brakes These brakes were great - cable-operated so easy to maintain, but amazing stopping power. 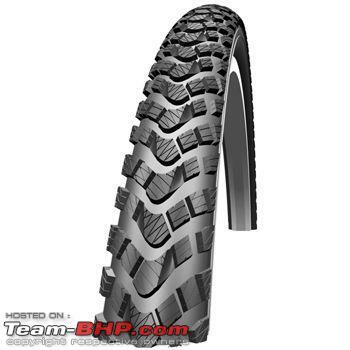 The rear tyre of Bontranger XR2 tire was changed to this tough one - not a a single puncture even with that overloaded bicycle - it is like our BF Goodrich of our Safari Dicor VTT! Here what an online review says: " Off road trails in the water and mud it just pumps out the water sideways and brings very little back up. 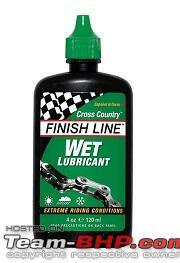 On the dry, gravel or on tarmac it is just the same sure grip. 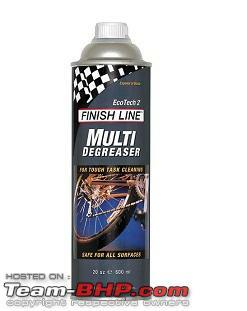 To date no punctures under all conditions, well worth the money." The stock rear Bontranger xr2 became the spare tyre. 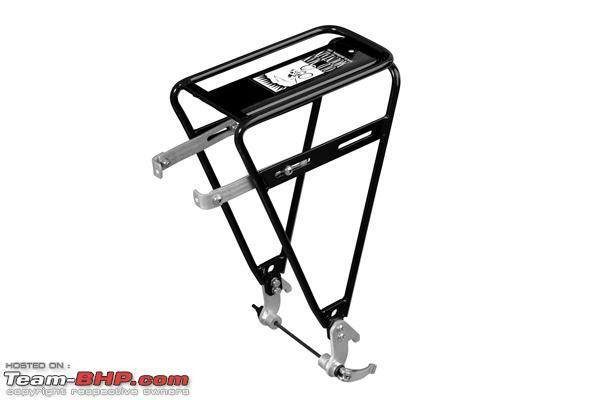 A tubular aluminum rear rack designed for heavy-duty, long distance touring. 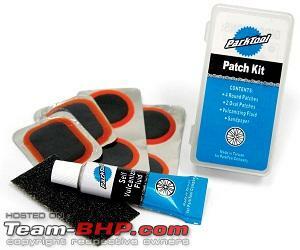 Specifically developed for bikes equipped with disc brakes. 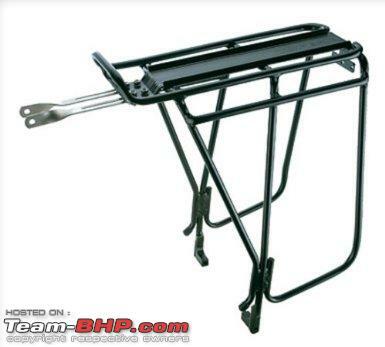 Integrated side bar provides a lower pannier attachment point – allowing more space for cargo on the rack top. 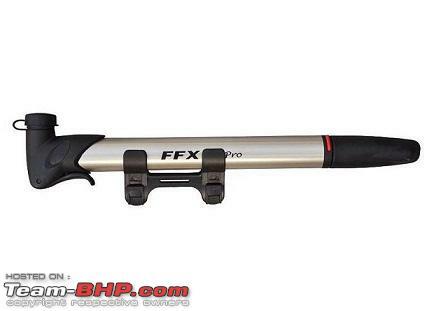 Suspension fork compatible and proven on expeditions far and wide. 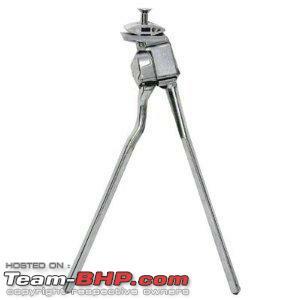 The clamps have to be ordered separately, missed out on that. The rack on the top was as such held in the place by a number of zip ties. Electrical pipe clamps from the local hardware store can also be used. Brilliant German design and incredibly easy to take on and off the racks. 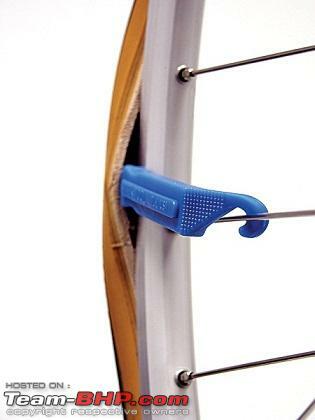 The entire back of the bag is a solid plastic backing plate that helps to structure the panniers and keep them secure on the rack. No rocking or slopping, especially important on bouncy gravel Manali-Leh tracks. A vital component, the stem extender raises the handlebar to gives that semi-upright position for long distace bicycle touring, less crouching over and no neck pain - suited me as the frame size was just about okay for me but the stock stem height was too short. Best bang for buck, replaced the stock seat with this most basic saddle. The stock seat was carried as a spare. 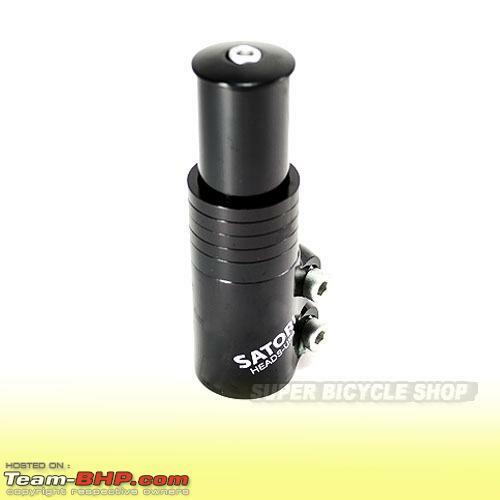 Small air pump x2. 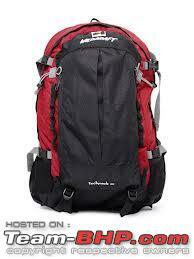 - One attached to the frame, and the spare one in one of the panniers. Inner tube x 1 Didn't use any, but glad to have them in the bag. 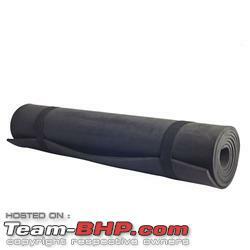 Bontranger SR2 tyre, the stock one, - Didn't use it, but glad to have it. 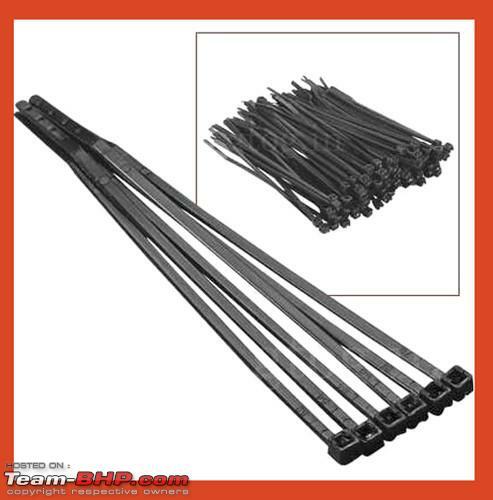 Cable-ties - a full packet. 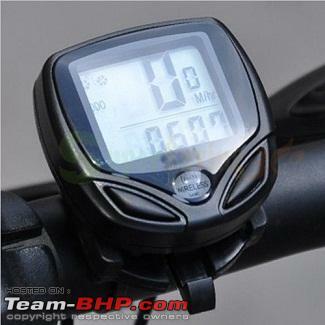 Wireless speedometer/computer : None, magnet fell off from the sensor transmitter that is attached to the spoke during a fall during the training part here in Kolkata itself. But still in some pictures it may show it is attached as thought of showing to some cyclist, if I meet on the route, as to why it is not functioning! I had this cheap one bought from ebay and it was quite okay till that fall. A basic one bought out here from a local company, Ria Mount Support, here in Kolkata. Secured on top of the rear carrier of the bicycle. At a huge weight of over 3 kgs this was too much weight for a tent intended for bicycle. 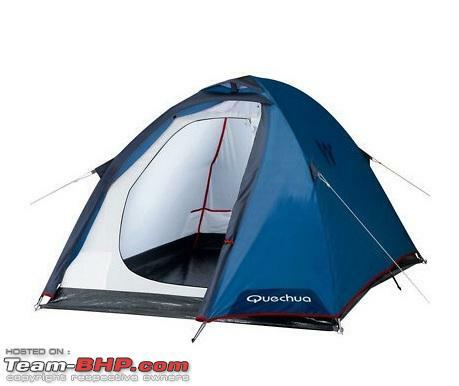 Otherwise the tent is a beautiful constructed one and for the money it is very good. But as said should have taken a more lightweight tent. Of course, a Hilleberg Nallo GT3 would be the ideal or even an Eureka Spitfire [they weigh around or less than a kilo], but then they do cost quite a lot relatively to the one that I carried. 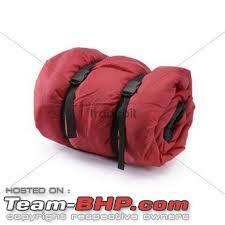 Basic sleeping bag bought from a local trek shop in Kolkata. Sold as -10, bearable till around zero. Heavy this too also in relation to the better ones. 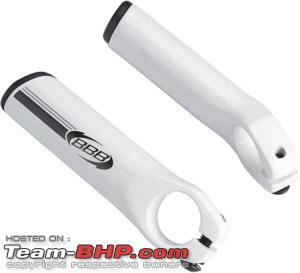 Headtorch - did not take any bike light. This doubled up as the bicycle night as I hurtled down Tanglangla after sundown to Rumste - absolutely not a good idea. A dedicated cycle light is a must, just in case if needed. 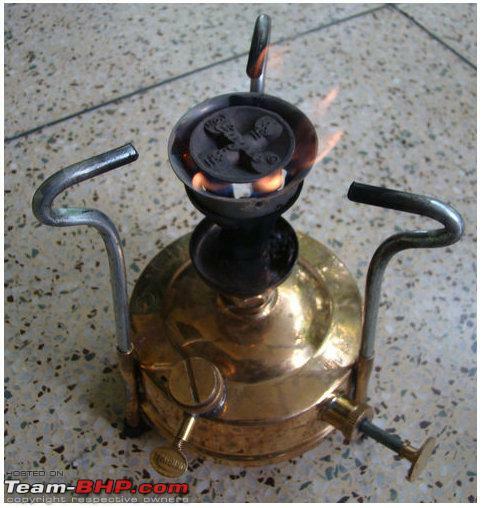 Fuel stove: Light weight folding brass kerosene stove. Along with 10 maggi packets and this stove, though never used the whole trip. - It was more of a backup in case I get stuck in this late month of September, to survive for at least a week. 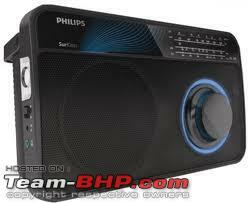 Philips Radio - listened to it in the night particularly during the night camping by Tso Kar - just for the heck of it. Can be skipped, after all the batteries are the hidden weight other than the radio itself. Mostly the Chinese channels were there on SW, but locked to a station that played the old songs. Match boxes, lighter may not function in high altitude. Tenn Mens 8 Panel Cycling Shorts with Professional Moulded Pad. This one was the only specific cycling clothing. "These high performance breathable shorts are technically designed for serious cyclists. 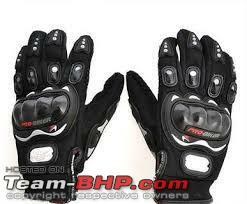 Incorporating an 8 panel professional construction with flat stitched seams, which allow the shorts more curvature whilst minimizing chafing and therefore offering the cyclist better performance and comfort"
Gloves - The Probiker gloves for my Royal Enflied Bullet rides doubled up as my cycling gloves. 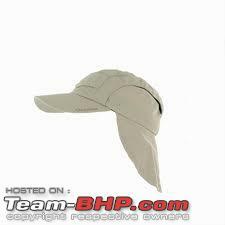 Though the above one was there, all through used this one - just for it looked better on me! 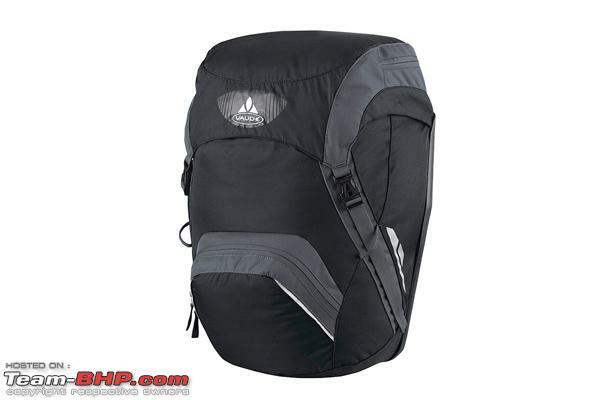 However, the above product is very good for high altitude travel under the sun. Raincoat - Duckback, basic - never used. Shoes - Hitec Trekking shoes, heavy - better to have the light cycling shoes if trekking is not a part of the travel. Mitts x 2 - large and small. 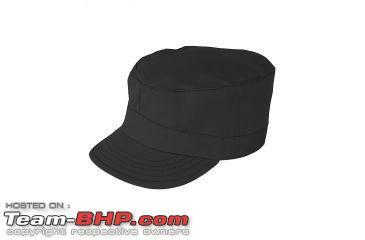 Cycling Helmet - did not use. 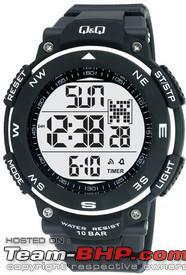 The big dial kept me well oriented to time and date, absolutely vital as you trudge along those desolate tracks. Canon 60D with 15-85 lens, 11-16 Tokina and 55-250 mm Canon kit lens. Close to 3 kg of weight with the camera bag. I even had the temerity to carry the tripod [vanguard aluminum one that weighed some 2.5 kg] which was ditched at the first stop itself at Kothi. I had this grand idea before the trip that while cycling along this highway, it would be great for photography as I would be going more slow, stopping and clicking more frequently. By 2nd day itself the reality hit hard. Bicycling and photographing with a DSLR are poles apart. Every time I stop for a photo, it is not like that of a car or bike that you give the throttle and again you go - a start and stop at that high altitude is a huge physical strain. And all those small stops as you meter and frame a scene, takes away vital time, particularly for me as I was going well below the average speed of an established cyclist. Not surprisingly I have way better photographs when we did that trip by our Safari in October 2010. With micro 4/3rds almost or equal to DSLR levels and with huge weight reduction, it makes more sense for those to carry or even a pocket camera. Another thing, by the time I move along Zingzingbar on way to Baralachala top, I had lost count and track on which card what was being written and what was being formatted and what had been downloaded to the laptop. As I find out a card of images were overwritten - so vital point this also to keep in mind. Maps and GPS: A road distance map of the Manali Leh route was there on the laptop - but signages are there on the road. Dont have a GPS, anyway there is just one track and the heights are all there on the net. A basic one that I have in my house, weighs in at 2+ kg - better would be a notebook or ultralight one. Coca 30 - a homeopathic medicine used by some high altitude trekkers. One starts taking it some 5 days before the trip and continued it till I finished up with the 3 bottles I had. Sweet homeopathic medicine and no side effects. Of course Diamox is the tablet as everyone knows, but then never taken in any one of our journeys. Coca 30 best suits me, having travelled to the high altitude terrains all along the Himalayas and also have found that I am less susceptible to high altitude. The usual medicine strips taken for fever, diarrhoea and analgesics/pain. Rs 10,000 as cash in person. Last edited by adc : 12th April 2013 at 14:21. Man a route which takes guts to just do by car, you go and achieve on a bicycle. Hats off to you Sir. O boy, amazing and awesome is an understatement! Superb. Mindblowing. It feels really nice to see BHPians taking path less travelled/going solo in a kayak. Beautiful. I commend your courage and grit and determination. Someday I want to do the same trip. Kudos for having the mental strength of going through this! Went speechless and motionless after reading the first few paragraphs. My fingers are stuck not knowing what to type. Took nearly 10 mins to get back my senses. Hats off to you sir . Please keep the log rolling. Subscribed and rated a well deserved 5* (Deserves much more though). First we get to read a sea level - solo Mumbai to Goa in a kayak and now there is a solo bycycle - quite literally at the roof of the world. What a treat. Awaiting the pictures and the travelogue. Much waited travelogues dada. I was waiting for this since last meet with u @ china town. What a great start, a travelogue starts with 5 'SITARE' . After reading "Kamen_rider" Kayaking travelogue this will be the most nail-biting travelogue going to happen. Team-BHP is really such a place, only where we can get this great enthusiasts with braveheart. Awesome. You are setting the bar even higher. 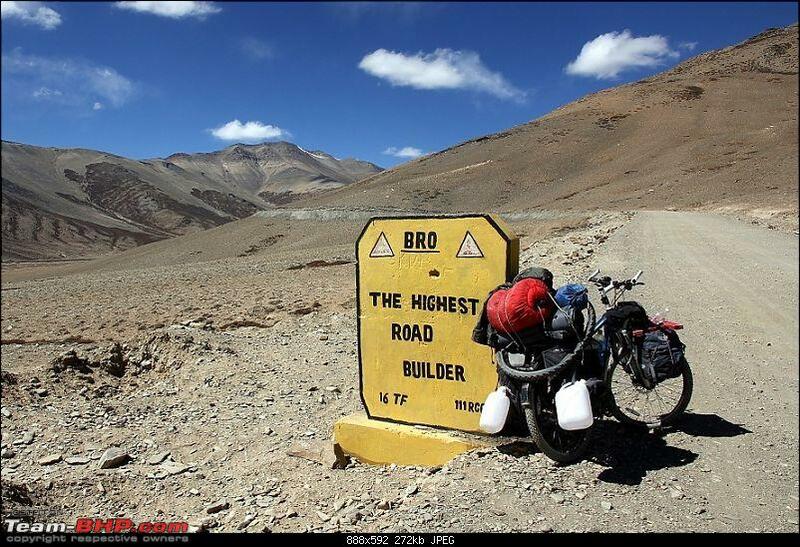 I have religiously followed your trip to Leh, Arunachal Pradesh & other Bullet tours but one seems to be best of all. I feel this travelogue can be rated at par with Kamen's kayak trip from Mumbai to Goa. Most of us here are currently dreaming of doing a Kayak tirp the way Kamen did, now we have one more dream - Cycling trip to some unknown destination. By the way on couple of days you managed to travel 78 & 75 kms in a day. This is simply amazing? Was all this distance (78 & 75 kms) downhill travel or on plains? What was the diet that you observed during these days? Anything special like high calorie foods? You ACTUALLY went and did it! Hats off to your stamina and willpower. I realized the idea didn't start in your head 5 months before the trip, it started sometime after you came back from your 2010(?) 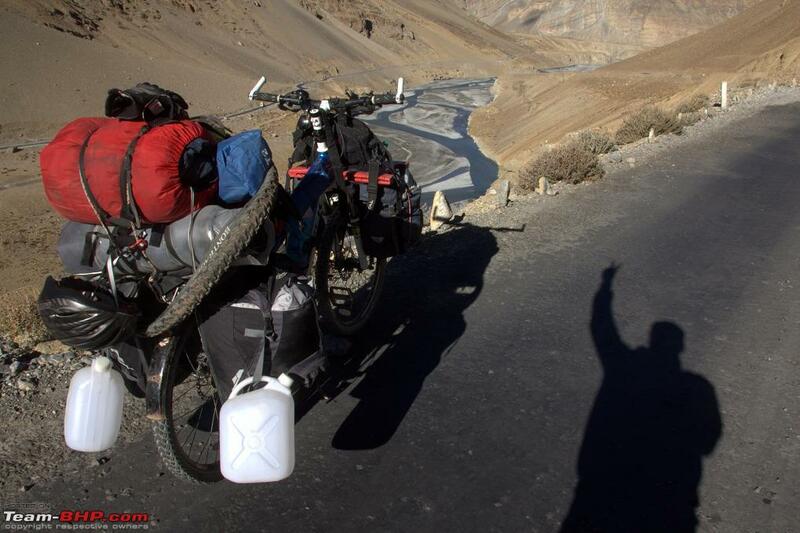 trip - I recall you had mentioned about wanting to cycle to Leh, when we'd met up at Kolkata afterwards. 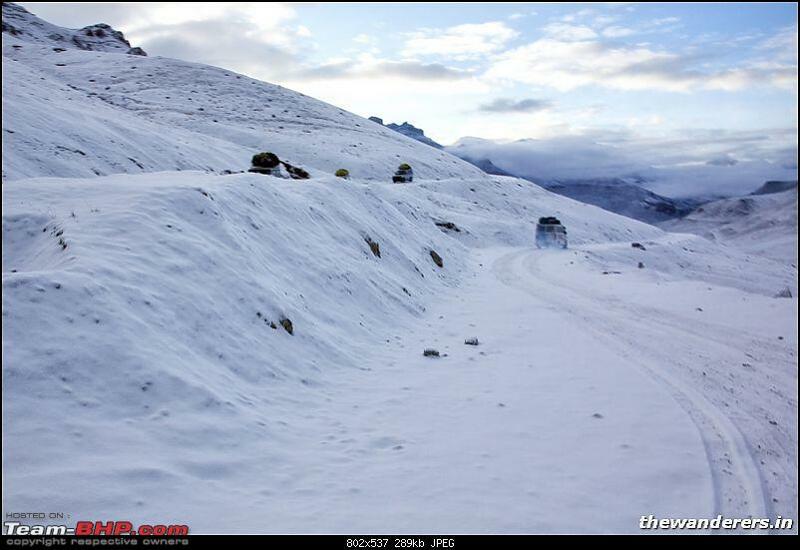 And you went and did it without an external support team, unlike many others who do this route from Manali with a couple of supply-and-support vehicles accompanying them! 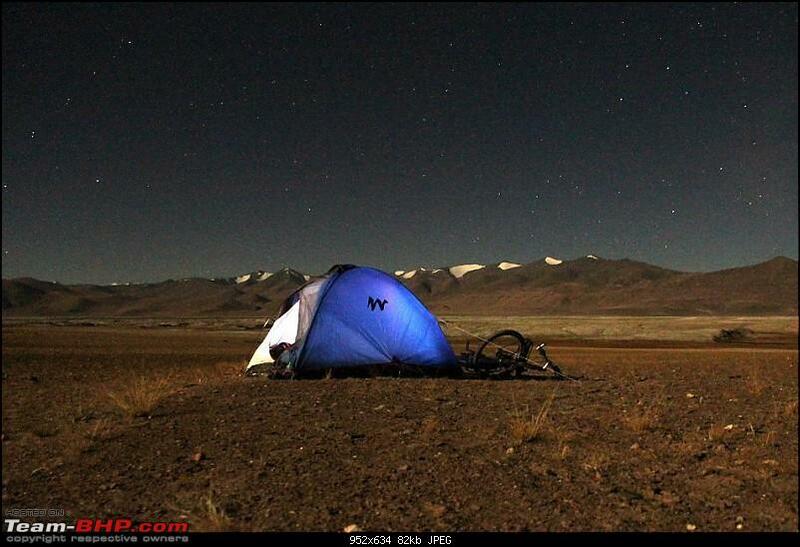 A group of cyclists set up camp in the open field next to the hotel. Supported by 2 vehicles, a group of about 8 Indian cyclists were taking the trip from Manali to Leh. 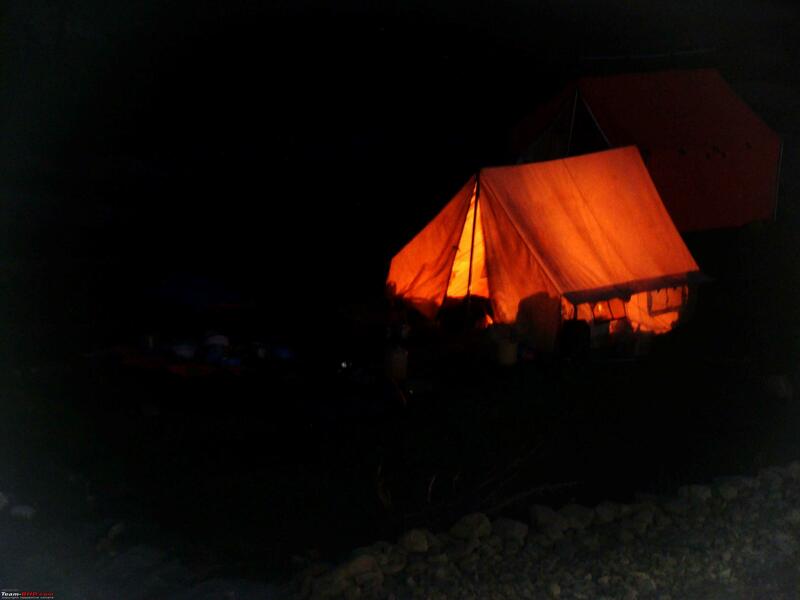 They had their own tents, cook and kitchen equipment, and planned to set up and break camp every day with about 8 hours of riding time in between. Brave souls with titanium butts! Looking forward to the progress of the log. Thank you all for the appreciation. Good to start out on this long pending one -- the writing takes more effort than the trip! Thanks again. As a voracious reader of travelogues on the internet, I do take inspiration from many a guys out here in teambhp and from the interent in general - and let me tell you from you by the way you quit cigarettes! Thank you jignesh. Each and every trip had something unique whether it be the Leh, the Zanskar or the interior Kashmir or even that one we found that secret beach in middle of a dense forest in Orissa/Chhattisgarh border - each one has been a journey to remember. The first one [78 km] was tough, if calculated wrong, Tanlangla pass is a brutal one and as said it plays with your mind [how - more on it later ], the whole terrain while going up is rocky, full of stones and sandy too in parts. That was one day things could have gone wrong, it was only by around past 5 that I reached the top and then how I came back to Rumste was too close a call. The second one [75 km] is done quite okay as it is a dowhill for sometime and then a more or less a slight incline all the way to Leh. Diet - nothing special - same omellets, maggi and all that. At Leh ordered chicken to chips to this and that - good food at last. How the cycling idea came to being is what is in the next post - a very unlikely condition some 5 months back before the actual travel initiated this whole thing. Cycling was just thought of in 2010 during our family Ladakh trip [ http://www.team-bhp.com/forum/travel...-oct-10-a.html ] but it was more of a a statement and lay dormant like so many wild ideas - and so many still roaming around in the head!! The bicycle was bought on 28 May 2012 and that is from when all the serious planning started - from purchase to training to bicycling again after 24 years. Last edited by adc : 12th April 2013 at 19:46.